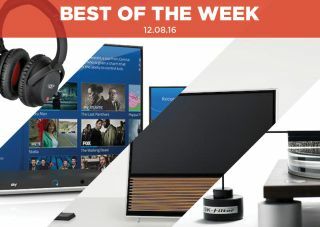 Best of the Week: Samsung 4K TV, Sky Q, budget noise-cancelling headphones and more | What Hi-Fi? A round-up of stories to have featured in What Hi-Fi? this week, including Samsung's SUHD TVs, Sky Q and Virgin Media's 4K TiVo box. This week Bang & Olufsen launched a 4K TV, Furutech devised a novel way of removing static from your turntable and Samsung SUHD TVs will now come with a ten-year warranty. As for reviews, we have Sky Q, Lindy's BNX-60 noise-cancelling headphones and the Go + Play wireless speaker from Harman Kardon. Bang & Olufsen's luxury 4K TV will be available in two sizes – 40in and 55in – and arrives with plenty of fancy accoutrements including a "360 degree Automatic Picture Control sensor", that can adjust images based on the amount of light in the room. Prices for the 40in set start at £4495 and £6495 for the 55in. Furutech claims to have come up with a method of removing static from a turntable whilst the record is playing. The SK-Filter sits above the record and removes any static generated, allowing the record to continue playing unencumbered. Samsung has been investing in Quantum Dot over OLED technology for its TVs, and with it being a new piece of tech, Samsung has given its range of SUHD TVs a ten-year warranty. "With Q, Sky really has never been better, but it has also never been more expensive"
Sky has touted its new Q box and service as the future of TV, and it's a claim that's not far from the truth. Whether you want to watch in another room, or take your content with you on-the-go, Q works seamlessly, with few hiccups. There's plenty of 4K content too, which instantly makes it an attractive proposition. However, as you might expect, Sky Q doesn't come cheap. "As a pair of noise-cancelling headphones with the added bonus of wireless Bluetooth, we can’t quibble with what’s on offer"
For the price you might expect these headphones to disappoint. Instead they offer a balanced and detailed sound, making for a pleasant listen. With noise-cancelling and wireless performance both very capable, these sturdy Lindy headphones have few faults. "If you want a powerful but portable wireless speaker, and this fits your budget, then this is where to spend your money"
We liked the original Go + Play and the latest incarnation continues the good work. It's a huge speaker - a hi-fi handbag of sorts - with a power befitting its size, but there's also finesse here too. For a powerful wireless speaker that's also portable, this is a great option.